SmartScreen filter in Windows 8 is a wonderful security tool, but sometimes it becomes annoying when this filter continuously produces unwanted security prompts. 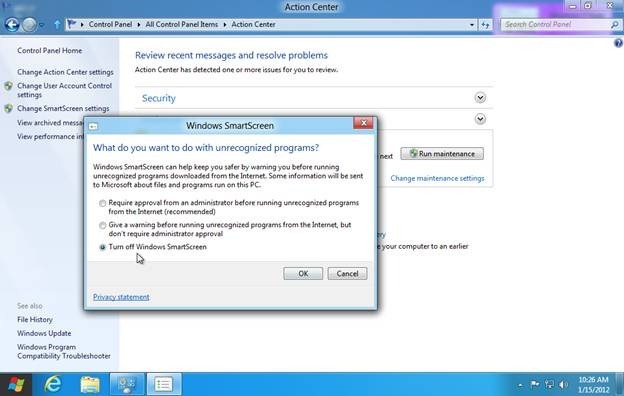 Here, is how to Disable SmartScreen filter in Windows 8 as well as in Internet Explorer 10. 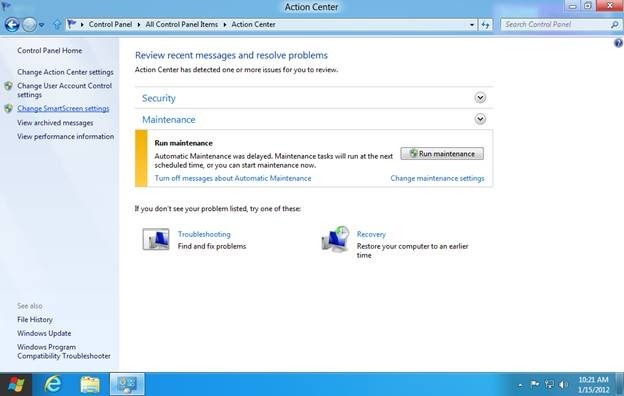 SmartScreen Filter in Windows 8 protects your system from malicious apps. The smartscreen filter produces security alert whenever it comes across any suspicious app. Similarly, SmartScreen Filter in Internet Explorer 10 protects your system from malicious websites and produces a security prompt when you try to visit any such website. However, this security tool becomes a curse when you continuously keep on getting security warnings, sometimes even for the secure apps. Eventually, if you have planned to get rid of the smart screen filter, here is how to disable smartscreen filter. Open “Control Panel” and click “More settings”. This will open desktop style control panel. Switch to “Large Icons” view and double-click “Action Center” to open it. Click “Change Smart Screen Settings” present on the navigation bar on the left side of the screen. This will open Windows SmartScreen dialog box. Click to select “Turn off Windows smart screen” radio button. Click OK button and you are done. You just turned off Windows smart screen filter. 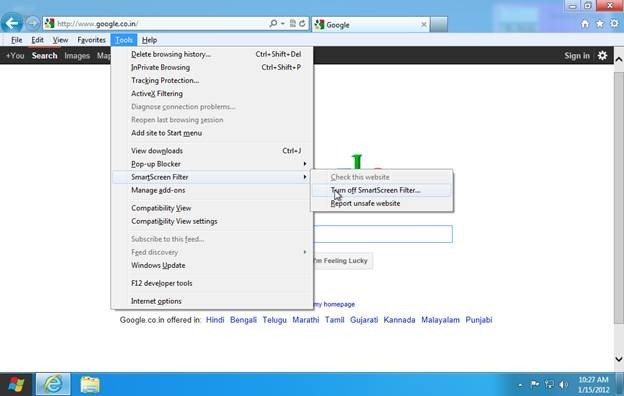 To turn off Internet Explorer 10 smart screen filter, click Tools (Alt + T) -> Smart Screen Filter -> Turn Off SmartScreen Filter.